We have just removed the invite system from FriendBinder which means anyone can now join! Friendbinder is Multi-social network client, it connects to all your existing friends on Facebook, Twitter, Flickr and others. It allows you to update your statuses to Facebook and Twitter. You can also comment and like Facebook content from the stream. For Twitter content you can reply or retweet inline and view a thread of replies from your friends. 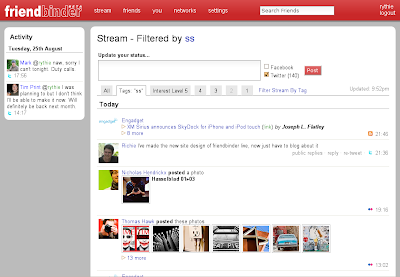 FriendBinder also allows you to view the photos from your friends on Flickr and photos they have favourited. FriendBinder works in a similar way to a twitter client in that your friends do not have to join FriendBinder, you will always see all of your friend's content. You can join at http://friendbinder.com. I hope you enjoy friendbinder and please report to us any problems or tell us of features you would like. Friendbinder brings together your friends from different social networks. It lets you keep track of all your friends in one place, saving you time and lets you post updates and replies.